meghan eats local: Fro Yo = No Go? As I explained in a recent post, when I go out to eat, I prefer an interactive experience. I get a real kick out of combining my own ingredients. And the only thing better than combining my own ingredients to make a meal is combining my own ingredients to make a dessert. I loved going out for frozen yogurt ("fro yo" for short) and choosing my own toppings when I lived in Boston, but I always resented the person behind the counter putting the toppings on my frozen yogurt. Every fro yo shop would have one guy who was really generous and would keep heaping on the toppings until you said, "Perfect!" but sometimes you'd get the stingy guy who gave you like, two strawberries and three chocolate chips. I hated that guy. So imagine my joy when I discovered do-it-yourself fro yo shops in LA. The trend has probably spread back east by now, but a few years ago when I moved to Venice Beach, I'd never seen one of these shops before. You get to put the toppings on yourself. As much as you want. And you pay by the total weight of your fro yo cup. When I moved to Santa Barbara, I discovered a do-it-yourself fro yo shop just down the street from my apartment. My roommates and I often went to get fro yo late at night when we were bored with doing homework but felt that it was still too early to go to bed. I just couldn't say "no" if someone suggested going to get fro yo; likewise, if I had a fro yo craving, I knew there would always be someone willing to make the trip with me. Well, now I'm just getting depressed. I've been missing fro yo for a while - the taste as much as the do-it-yourself experience. I've seen some vegan ice cream and frozen yogurt options at the Isla Vista Coop, but grabbing a box of frozen yogurt from the freezer just isn't the same. It's not work-intensive enough for me. So I decided to make my own vegan fro yo. 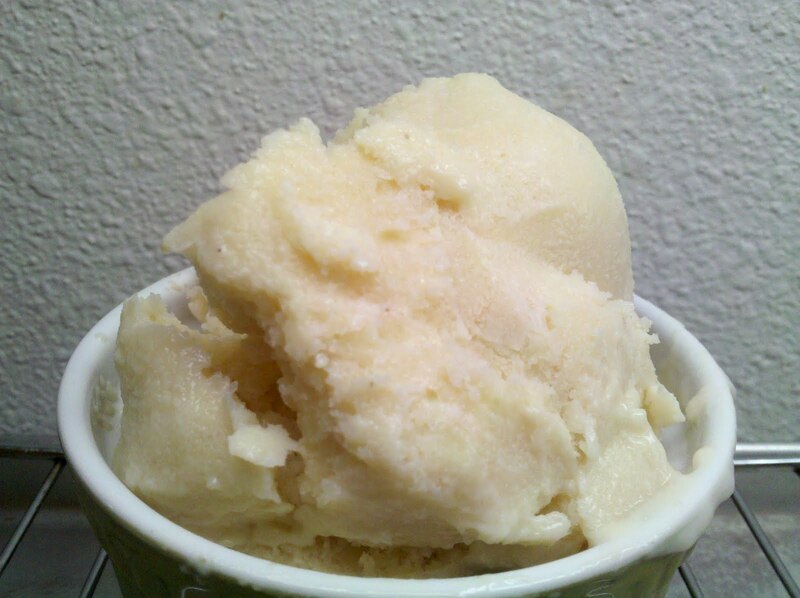 I used this recipe because it doesn't require an ice cream maker. I own a lot of random things, but an ice cream maker is not one of them. I know what you're thinking: What the pho is xanthan gum? It sounds like something you'd pour into a super villain's weapon machinery to foil his plan. But it's actually a polysaccharide used as a thickening agent in salad dressings, cosmetic products, and, apparently, homemade vegan frozen yogurt. I used Amy's spice mill (which we usually use as a coffee grinder) to grind the cashews up. Then I combined the soy yogurt, agave nectar, cashews, and vanilla in a food processor. Here's where I ran into problems: I couldn't figure out how to use the food processor. I know that sounds like a rookie problem, but seriously - this food processor is from 1965 and it won't start unless all the pieces are clicked in together just so. I fumbled around with it until I was thoroughly embarrassed. It wouldn't start. So I decided to go medieval on the fro yo mixture and beat it up by hand. When the mixture was smooth, I added the xanthan gum and mixed everything up for another 30 seconds. It was tasty! It was a little tart, and I am still not sure why ground cashews needed to be in the equation. But Amy and Emily agree that the vegan fro yo was a successful endeavor. Even though I know I can make my own vegan substitute for fro yo, I'm still bummed about not being able to partake in fro yo outings. But there actually haven't been too many instances in which I've had to turn it down. That makes me think that maybe I was the one always pressuring everybody to get fro yo with me in the first place. Now that I'm not interested, maybe the fro yo trips just don't happen anymore. If that's not the case and you guys go without me all the time, thanks for not metaphorically rubbing it in my face (or literally rubbing it in my face, for that matter). But if it is the case - if you are reading this and thinking, "Meghan's right! Now that she doesn't suggest getting fro yo, I just don't go anymore!" - come on over. And bring some toppings. There are 3 of those places in Princeton, NJ. Come grab some with me!!! Kin: I want that yonanas thing! I'm going to Solvang today where they have an "As Seen on TV" store, and I hope they carry it.